This entry was posted in birds, critical thinking, feeding, hummingbirds and tagged bird feeding, birds, feeding birds, hummingbirds by Sheri. Bookmark the permalink. I just wish to say I appreciate the info you have posted on here. I was at a friend’s house this weekend and she was talking of putting up a hummingbird feeder. They drink well water and it is slightly colored with minerals (I hope, but we’ve never gotten sick drinking it) I was able to tell her that the well water is not good for the hummies and she said she will get filtered water specifically for them. Glad to help! As for your other “someone,” you should encourage them to sniff hummingbird-pollinated flowers such as Trumpet Creeper, Coral Honeysuckle, and Scarlet Lobelia. Even in the aromatic-foliaged sages, the flower itself has no fragrance, which is thought to help avoid attracting competing insects. Blunt and to the point, hummers have almost NO sense of smell! Wow- I thought white (granulated) sugar was dyed and that the brown form of it was in its natural state, therefore being more healthy for Hummingbirds. Good thing I’ve been using regular white sugar. I didn’t know about the honey/ molasses either- who knew! Thanks for this valuable information. Kirkland organic sugar from Costco is light cream in color. States that it is “organic cane sugar” and can be used as a “one-for-one replacement for refined white sugar.” I’m not privy to the processing and wonder if there is too much iron in this product and that I should use pure white sugar (e.g. C&H). Personally, I like the taste of Costco’s organic sugar over pure white sugar but want to use the healthiest product for hummingbirds. Thank you. As the post indicates, organic sugar is non-white and contains potentially dangerous amounts of iron. I like the taste of organic/raw/turbinado sugars, too, but I use only fully refined white sugar to make feeder solution. I have well water, and have been using it to feed my hummers for 13 years. I never heard of this being harmful? It depends on the quality of your well water, Sandy. Surface contamination can introduce bacteria, protozoan parasites, and chemical pollutants (pesticides, fertilizers, petrochemicals from roadways, etc. ), and the underlying geology can contribute “natural” (but still potentially dangerous) contaminants such as iron, arsenic, lead, and hydrocarbons. Boiling well water will get rid of potential pathogens, but the other contaminants aren’t so easy to remove. If any of these are known or suspected to be in your well water, it would be wise to use reverse-osmosis filtered water for drinking, cooking, and making hummingbird feeder solution. No. Hummingbirds sometimes drink the juices of overripe fruits, especially when competition for flower nectar is high. Oranges and lemons aren’t native to the Americas, but there’s nothing in them that would be toxic to hummingbirds, even if they were GMO. Pesticide residues are an actual threat to hummingbirds and other wildlife, so give them organically grown fruits or wash conventionally grown fruits well before serving. White sugar is good ? For hummingbirds? Yes. For humans? Not so much. I’ve gone over and over and over and over this. If I boil the well water that is somewhat high in iron, will it be safe to use. I do not have any filter on well and my family has never had any problems. Will boiling remove iron. Also, will a salt flush system be harmful to the birds if I add one onto my well aystem? Unless you feed huge numbers of hummingbirds, I’d recommend using bottled water to make your feeder solution, at least until you come up with a way to treat your well water. My tap water comes from wells contaminated with arsenic, so I mix it with water purified by reverse osmosis to make feeder solution. I don’t know what a “salt flush system” is, but as long as it doesn’t raise sodium levels in the water it shouldn’t be a problem. as there such a thing as organic white sugar? I don’t want to feed them all of the pesticides sprayed on regular white sugar. What is marketed as “white” organic sugar hasn’t been purified to remove the residual iron, so it should not be used to feed hummingbirds. Conventional white sugar is a purer product, even though the crops it is extracted from were treated with pesticides/herbicides. There’s no evidence of health risks from whatever minute traces of these chemicals might remain in the final product, even at hummingbird consumption levels. Of more concern is their effect on the environment where the sugar is grown. I read this article just in the nick of time! I was going to try agave in place of sugar this morning, but decided to check internet, first! Thank you! 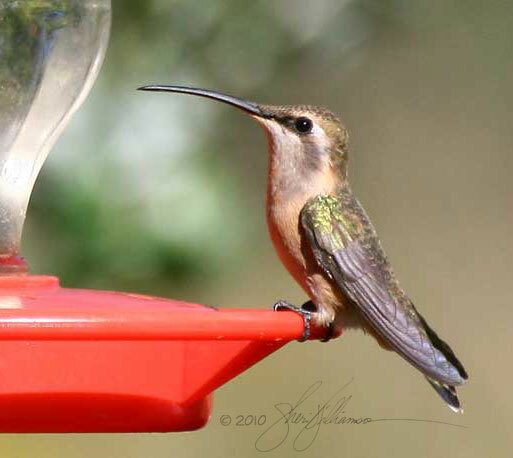 On the contrary, Jane: The article doesn’t argue that it’s not bad, only that hummingbirds will drink it. There’s a big difference. Reason 1: Maple syrup isn’t the same as maple sap. To become syrup, the natural sap must be boiled long and hard to concentrate the sugars and filtered to remove particulates. Unlike the multistage purifying processes that turn sugar cane sap into granulated sugar (which is 99.7-99.9% pure sucrose), these processes concentrate soluble contaminants present in the original sap and may introduce others, including heavy metals and cleaning compounds. Unscrupulous producers may subject their product to further adulteration to improve profits. Exponentially different consumption rates, metabolic rates, and lifespans make these issues relatively inconsequential for humans but potentially problematical for hummingbirds. Reason 2: Being a concentrated form of sap, maple syrup contains a much wider range of nutrients than either sugar water or the nectars of hummingbird-pollinated flowers, including approximately twice as much iron as conventional white sugar. If you think more nutrients in feeder solution is a good thing, keep in mind that the yeasts, fungi, bacteria, and molds that that infest feeder solutions think so, too. More nutrients in feeder solution translates to faster spoilage, creating more work for the person maintaining the feeders and increasing the risk of disease for the birds that visit them. Reason 3: Genuine, high-quality maple syrup is a prohibitively expensive substitute for white sugar unless you feed very few hummingbirds or own a maple grove. If money’s no object, you’d still be better off switching to quick-dissolving caster sugar (a.k.a. baker’s or superfine sugar) rather than using maple syrup. There are many scientific and practical reasons why white sugar has been the experts’ choice for feeding both wild and captive hummingbirds for more than half a century. If it ain’t broke, don’t fix it. Thanks for the answer Sheri! I’m switching to quick-dissolving caster sugar immediately!